Home > Archives > Northbound San Joaquin along San Pablo Bay, 1980s. Since Amtrak began operations in May 1971, regional leaders had urged Amtrak to implement passenger service in the San Joaquin Valley of central California. 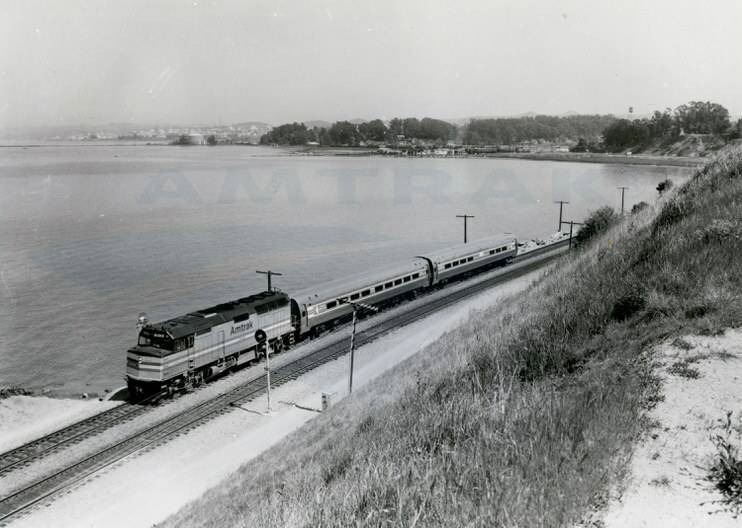 On March 6, 1974, Amtrak launched the San Joaquin with one daily round trip. From Bakersfield, passengers could transfer to a motor coach to reach Los Angeles. In February 1980, a second frequency was added through financial support from the state of California. In this image, the train is led by F40PH locomotive No. 313 wearing the Phase III paint scheme introduced in 1979. It also features Amfleet equipment - a coach and cafe car. As of 2013, the San Joaquin corridor offers four daily round trips between Bakersfield and Oakland, and two daily round trips between Bakersfield and Sacramento. The service is primarily financed and operated in partnership with the California Department of Transportation.